Today, we are going to explore a prefab design, which has been photographed by Thilo Hardtlein | Fotografie. This gorgeous prefab home will convince you – if you needed convincing – that prefab can be the way to go when it comes to design and architecture. Prefab homes have a variety of advantages including the fact that they are built in a much quicker time frame compared to to traditional bricks and mortar homes. They can also be more sustainable, especially if recyclable materials are used. The third advantage is that they can be built according to most specifications, which means that you can truly customize one into your dream home. Lastly, because they are mostly constructed in a factory and then just assembled on site, you have a lot of options available to you when it comes to where your house is positioned. This gorgeous double-storey home also shows us just how modern and magnificent a prefab home can be. Are you curious to see more? From this image, we can see just how modern and impressive this home is. It features two storeys, which play with space. The home is designed in a cube-shape, with a white and light wooden facade. This creates a very subtle and contemporary design, which is further illuminated by the beautiful soft glow that emanates out of the windows and doors. What is most impressive, however, is the raised wooden foundation that the home rests upon. This doubles up us a gorgeous, wrap-around terrace. 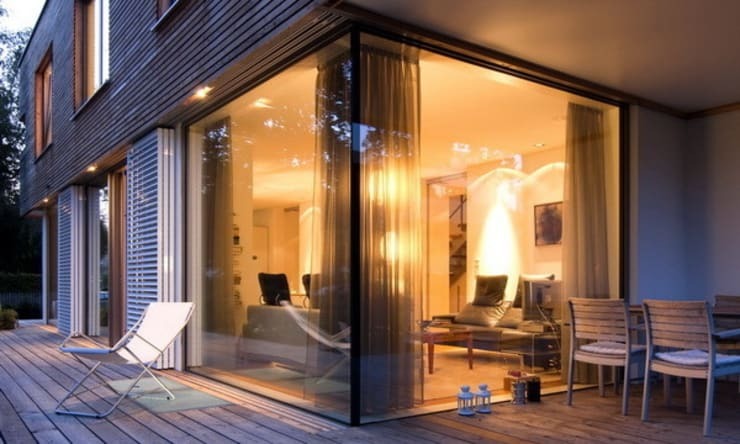 This allows the rooms to spill out onto the exterior space. We can also see how the beautiful garden that surrounds the home enhances the facade, creating a very beautiful overall look and feel. In this image, we really get a sense of how striking the facade is, while remaining subtle, neutral, earthy and slightly rustic. We can also see how the wooden terrace is actually rather large, allowing the family plenty of space to relax in the sunshine and fresh air. You could even furnish this space with some beautiful outdoor chairs, tables and sun loungers! Have a look at these 9 fabulous and super smart terrace ideas for inspiration. Here we get a chance to see this beautiful home in the daylight. We can see that the designers have used a corner of the wooden terrace to create a fabulous little outdoor dining spot. Couldn't you imagine enjoying some cool lemonade or a lovely dinner under the stars here? There is also a sun lounger, where you can enjoy a good book or an afternoon nap! We can also see how the large glass windows and doors allow the interior space to spill out onto onto the exterior, while allowing natural light to flow into the home. You'll notice that the large glass windows and doors are on the bottom area where the living space is while the more private spaces on the upper level aren't as open and visible. This is a great design tool! 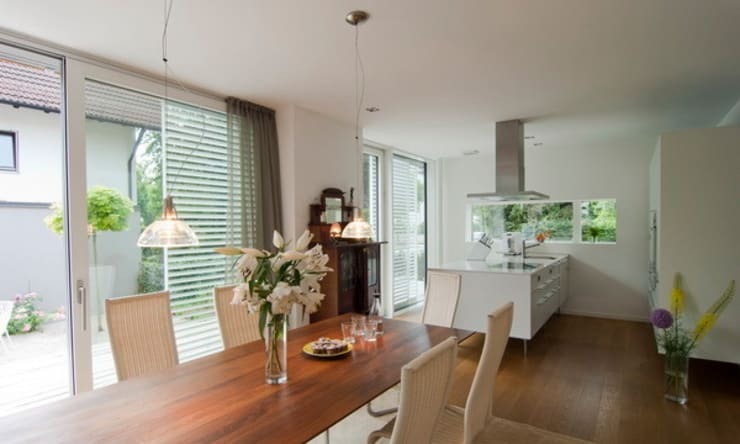 If we peek inside the home, we come across an open plan design with predominantly white and light wooden tones. This neutral interior design creates a very homely ambiance that is subtle with a classic and sophisticated look and feel. Here we really get a sense of how the natural light flows into the home, enhanced by the white walls and furniture. We can also see how it's the small details that really pack a punch in the home, including a fresh vase of flowers on the dining room table and the little lamps that give this room a beautiful, soft glow in the evening. 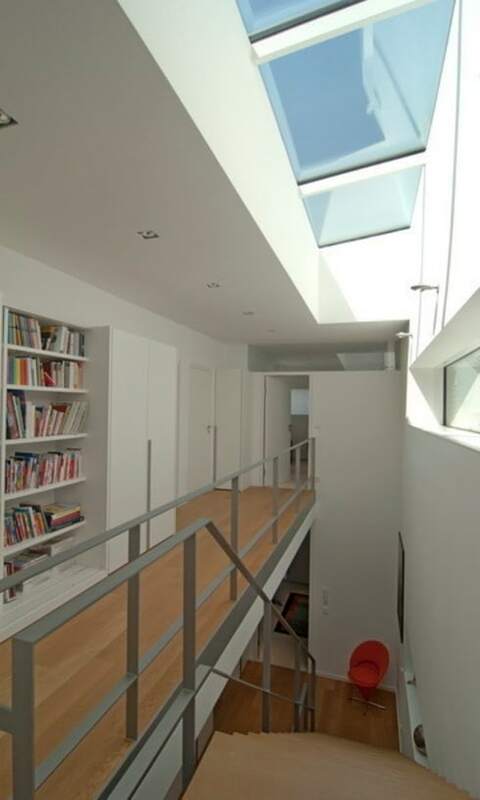 Another way to really ensure that the home is filled with natural light, creating a warm, impressive and spacious interior design, is to opt for skylights like the designers have done here. This is another great advantage to prefab homes – you truly can invest in as many doors, windows and skylights as possible. Skylights allow sunshine to flow in through the roof at all times of the day, which also means less money spent on electricity and lighting. Here we get a closer look at that beautiful, transparent barrier between the interior and exterior spaces. We can also see how the designers have added lightweight curtains to the windows, allowing the family a bit of privacy and shade if need be. Don't you love the contrast between the rustic wooden terrace and very edgy and modern glass windows? 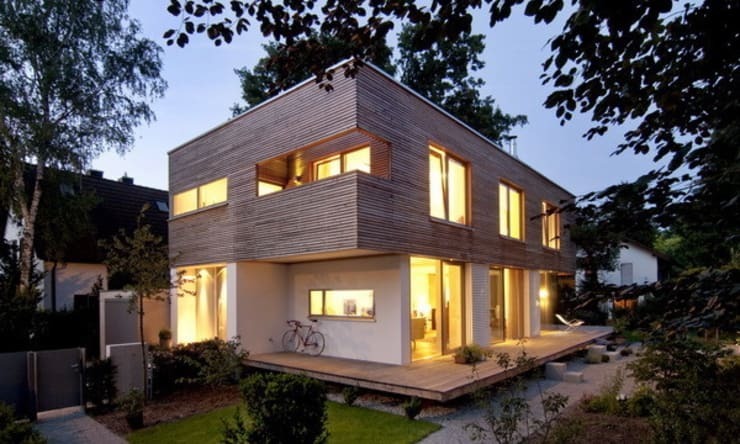 If you've enjoyed this home, have a look these tips before buying a prefab home. 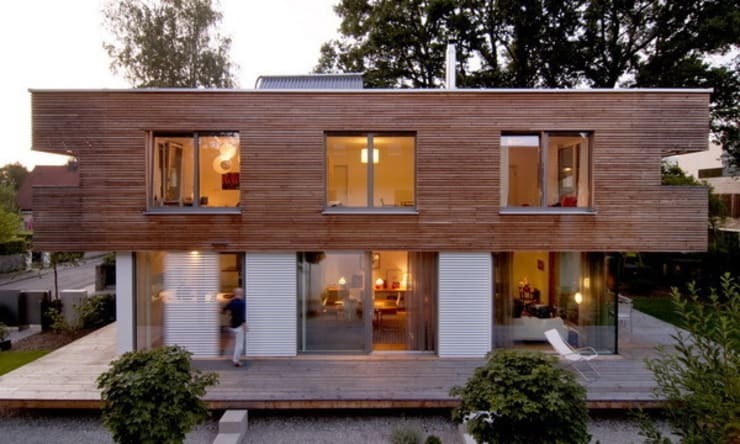 What do you think of this gorgeous prefab home?